This document is a guide for developers wishing to create distributed applications that take advantage of ZooKeeper's coordination services. It contains conceptual and practical information. The book concludes with an appendix containing links to other useful, ZooKeeper-related information. Most of information in this document is written to be accessible as stand-alone reference material. However, before starting your first ZooKeeper application, you should probably at least read the chaptes on the ZooKeeper Data Model and ZooKeeper Basic Operations. Also, the Simple Programmming Example [tbd] is helpful for understanding the basic structure of a ZooKeeper client application. The following characters can't be used because they don't display well, or render in confusing ways: \u0001 - \u0019 and \u007F - \u009F. The following characters are not allowed: \ud800 -uF8FFF, \uFFF0 - uFFFF. The "." character can be used as part of another name, but "." and ".." cannot alone be used to indicate a node along a path, because ZooKeeper doesn't use relative paths. The following would be invalid: "/a/b/./c" or "/a/b/../c". The token "zookeeper" is reserved. In distributed application engineering, the word node can refer to a generic host machine, a server, a member of an ensemble, a client process, etc. In the ZooKeeper documentation, znodes refer to the data nodes. Servers refer to machines that make up the ZooKeeper service; quorum peers refer to the servers that make up an ensemble; client refers to any host or process which uses a ZooKeeper service. A znode is the main abstraction a programmer needs to be aware of. Znodes have several characteristics that are worth mentioning here. Clients can set watches on znodes. Changes to that znode trigger the watch and then clear the watch. When a watch triggers, ZooKeeper sends the client a notification. More information about watches can be found in the section ZooKeeper Watches. ZooKeeper was not designed to be a general database or large object store. Instead, it manages coordination data. This data can come in the form of configuration, status information, rendezvous, etc. A common property of the various forms of coordination data is that they are relatively small: measured in kilobytes. The ZooKeeper client and the server implementations have sanity checks to ensure that znodes have less than 1M of data, but the data should be much less than that on average. Operating on relatively large data sizes will cause some operations to take much more time than others and will affect the latencies of some operations because of the extra time needed to move more data over the network and onto storage media. If large data storage is needed, the usually pattern of dealing with such data is to store it on a bulk storage system, such as NFS or HDFS, and store pointers to the storage locations in ZooKeeper. ZooKeeper also has the notion of ephemeral nodes. These znodes exists as long as the session that created the znode is active. When the session ends the znode is deleted. Because of this behavior ephemeral znodes are not allowed to have children. When creating a znode you can also request that ZooKeeper append a monotonically increasing counter to the end of path. This counter is unique to the parent znode. The counter has a format of %010d -- that is 10 digits with 0 (zero) padding (the counter is formatted in this way to simplify sorting), i.e. "<path>0000000001". See Queue Recipe for an example use of this feature. Note: the counter used to store the next sequence number is a signed int (4bytes) maintained by the parent node, the counter will overflow when incremented beyond 2147483647 (resulting in a name "<path>-2147483647"). Every change to the ZooKeeper state receives a stamp in the form of a zxid (ZooKeeper Transaction Id). This exposes the total ordering of all changes to ZooKeeper. Each change will have a unique zxid and if zxid1 is smaller than zxid2 then zxid1 happened before zxid2. Every change to a node will cause an increase to one of the version numbers of that node. The three version numbers are version (number of changes to the data of a znode), cversion (number of changes to the children of a znode), and aversion (number of changes to the ACL of a znode). When using multi-server ZooKeeper, servers use ticks to define timing of events such as status uploads, session timeouts, connection timeouts between peers, etc. The tick time is only indirectly exposed through the minimum session timeout (2 times the tick time); if a client requests a session timeout less than the minimum session timeout, the server will tell the client that the session timeout is actually the minimum session timeout. ZooKeeper doesn't use real time, or clock time, at all except to put timestamps into the stat structure on znode creation and znode modification. The zxid of the change that caused this znode to be created. The zxid of the change that last modified this znode. The zxid of the change that last modified children of this znode. The time in milliseconds from epoch when this znode was created. The time in milliseconds from epoch when this znode was last modified. The number of changes to the data of this znode. The number of changes to the children of this znode. The number of changes to the ACL of this znode. The session id of the owner of this znode if the znode is an ephemeral node. If it is not an ephemeral node, it will be zero. The length of the data field of this znode. The number of children of this znode. To create a client session the application code must provide a connection string containing a comma separated list of host:port pairs, each corresponding to a ZooKeeper server (e.g. "127.0.0.1:4545" or "127.0.0.1:3000,127.0.0.1:3001,127.0.0.1:3002"). The ZooKeeper client library will pick an arbitrary server and try to connect to it. If this connection fails, or if the client becomes disconnected from the server for any reason, the client will automatically try the next server in the list, until a connection is (re-)established. Added in 3.2.0: An optional "chroot" suffix may also be appended to the connection string. This will run the client commands while interpreting all paths relative to this root (similar to the unix chroot command). If used the example would look like: "127.0.0.1:4545/app/a" or "127.0.0.1:3000,127.0.0.1:3001,127.0.0.1:3002/app/a" where the client would be rooted at "/app/a" and all paths would be relative to this root - ie getting/setting/etc... "/foo/bar" would result in operations being run on "/app/a/foo/bar" (from the server perspective). This feature is particularly useful in multi-tenant environments where each user of a particular ZooKeeper service could be rooted differently. This makes re-use much simpler as each user can code his/her application as if it were rooted at "/", while actual location (say /app/a) could be determined at deployment time. When a client gets a handle to the ZooKeeper service, ZooKeeper creates a ZooKeeper session, represented as a 64-bit number, that it assigns to the client. If the client connects to a different ZooKeeper server, it will send the session id as a part of the connection handshake. As a security measure, the server creates a password for the session id that any ZooKeeper server can validate.The password is sent to the client with the session id when the client establishes the session. The client sends this password with the session id whenever it reestablishes the session with a new server. One of the parameters to the ZooKeeper client library call to create a ZooKeeper session is the session timeout in milliseconds. The client sends a requested timeout, the server responds with the timeout that it can give the client. The current implementation requires that the timeout be a minimum of 2 times the tickTime (as set in the server configuration) and a maximum of 20 times the tickTime. The ZooKeeper client API allows access to the negotiated timeout. When a client (session) becomes partitioned from the ZK serving cluster it will begin searching the list of servers that were specified during session creation. 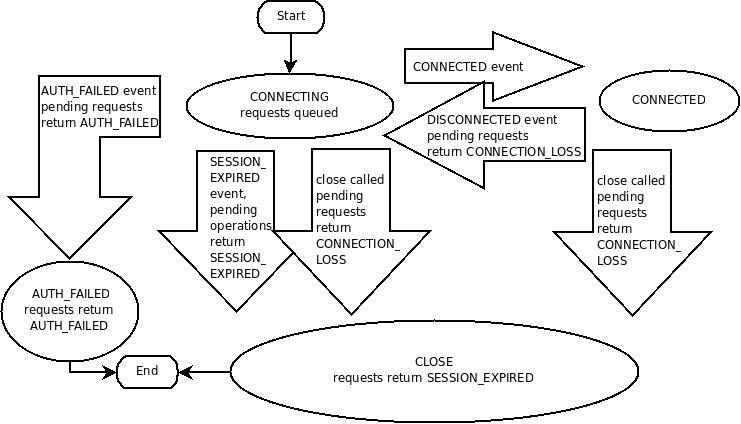 Eventually, when connectivity between the client and at least one of the servers is re-established, the session will either again transition to the "connected" state (if reconnected within the session timeout value) or it will transition to the "expired" state (if reconnected after the session timeout). It is not advisable to create a new session object (a new ZooKeeper.class or zookeeper handle in the c binding) for disconnection. The ZK client library will handle reconnect for you. In particular we have heuristics built into the client library to handle things like "herd effect", etc... Only create a new session when you are notified of session expiration (mandatory). Session expiration is managed by the ZooKeeper cluster itself, not by the client. When the ZK client establishes a session with the cluster it provides a "timeout" value detailed above. This value is used by the cluster to determine when the client's session expires. Expirations happens when the cluster does not hear from the client within the specified session timeout period (i.e. no heartbeat). At session expiration the cluster will delete any/all ephemeral nodes owned by that session and immediately notify any/all connected clients of the change (anyone watching those znodes). At this point the client of the expired session is still disconnected from the cluster, it will not be notified of the session expiration until/unless it is able to re-establish a connection to the cluster. The client will stay in disconnected state until the TCP connection is re-established with the cluster, at which point the watcher of the expired session will receive the "session expired" notification. Another parameter to the ZooKeeper session establishment call is the default watcher. Watchers are notified when any state change occurs in the client. For example if the client loses connectivity to the server the client will be notified, or if the client's session expires, etc... This watcher should consider the initial state to be disconnected (i.e. before any state changes events are sent to the watcher by the client lib). In the case of a new connection, the first event sent to the watcher is typically the session connection event. The session is kept alive by requests sent by the client. If the session is idle for a period of time that would timeout the session, the client will send a PING request to keep the session alive. This PING request not only allows the ZooKeeper server to know that the client is still active, but it also allows the client to verify that its connection to the ZooKeeper server is still active. The timing of the PING is conservative enough to ensure reasonable time to detect a dead connection and reconnect to a new server. The ZooKeeper client disconnects from a server when there are pending operations to that server, i.e., there is a pending asynchronous call. Added in 3.2.0 -- SessionMovedException. There is an internal exception that is generally not seen by clients called the SessionMovedException. This exception occurs because a request was received on a connection for a session which has been reestablished on a different server. The normal cause of this error is a client that sends a request to a server, but the network packet gets delayed, so the client times out and connects to a new server. When the delayed packet arrives at the first server, the old server detects that the session has moved, and closes the client connection. Clients normally do not see this error since they do not read from those old connections. (Old connections are usually closed.) One situation in which this condition can be seen is when two clients try to reestablish the same connection using a saved session id and password. One of the clients will reestablish the connection and the second client will be disconnected (causing the pair to attempt to re-establish its connection/session indefinitely). One watch event will be sent to the client when the data has changed. For example, if a client does a getData("/znode1", true) and later the data for /znode1 is changed or deleted, the client will get a watch event for /znode1. If /znode1 changes again, no watch event will be sent unless the client has done another read that sets a new watch. This implies that an event is on the way to the client, but may not reach the client before the successful return code to the change operation reaches the client that initiated the change. Watches are sent asynchronously to watchers. ZooKeeper provides an ordering guarantee: a client will never see a change for which it has set a watch until it first sees the watch event. Network delays or other factors may cause different clients to see watches and return codes from updates at different times. The key point is that everything seen by the different clients will have a consistent order. This refers to the different ways a node can change. It helps to think of ZooKeeper as maintaining two lists of watches: data watches and child watches. getData() and exists() set data watches. getChildren() sets child watches. Alternatively, it may help to think of watches being set according to the kind of data returned. getData() and exists() return information about the data of the node, whereas getChildren() returns a list of children. Thus, setData() will trigger data watches for the znode being set (assuming the set is successful). A successful create() will trigger a data watch for the znode being created and a child watch for the parent znode. A successful delete() will trigger both a data watch and a child watch (since there can be no more children) for a znode being deleted as well as a child watch for the parent znode. Watches are maintained locally at the ZooKeeper server to which the client is connected. This allows watches to be lightweight to set, maintain, and dispatch. When a client connects to a new server, the watch will be triggered for any session events. Watches will not be received while disconnected from a server. When a client reconnects, any previously registered watches will be reregistered and triggered if needed. In general this all occurs transparently. There is one case where a watch may be missed: a watch for the existence of a znode not yet created will be missed if the znode is created and deleted while disconnected. Enabled with a call to exists. Enabled with a call to exists, getData, and getChildren. Enabled with a call to exists and getData. Enabled with a call to getChildren. Watches are ordered with respect to other events, other watches, and asynchronous replies. The ZooKeeper client libraries ensures that everything is dispatched in order. A client will see a watch event for a znode it is watching before seeing the new data that corresponds to that znode. The order of watch events from ZooKeeper corresponds to the order of the updates as seen by the ZooKeeper service. Watches are one time triggers; if you get a watch event and you want to get notified of future changes, you must set another watch. A watch object, or function/context pair, will only be triggered once for a given notification. For example, if the same watch object is registered for an exists and a getData call for the same file and that file is then deleted, the watch object would only be invoked once with the deletion notification for the file. When you disconnect from a server (for example, when the server fails), you will not get any watches until the connection is reestablished. For this reason session events are sent to all outstanding watch handlers. Use session events to go into a safe mode: you will not be receiving events while disconnected, so your process should act conservatively in that mode. ZooKeeper uses ACLs to control access to its znodes (the data nodes of a ZooKeeper data tree). The ACL implementation is quite similar to UNIX file access permissions: it employs permission bits to allow/disallow various operations against a node and the scope to which the bits apply. Unlike standard UNIX permissions, a ZooKeeper node is not limited by the three standard scopes for user (owner of the file), group, and world (other). ZooKeeper does not have a notion of an owner of a znode. Instead, an ACL specifies sets of ids and permissions that are associated with those ids. Note also that an ACL pertains only to a specific znode. In particular it does not apply to children. For example, if /app is only readable by ip:172.16.16.1 and /app/status is world readable, anyone will be able to read /app/status; ACLs are not recursive. ZooKeeper supports pluggable authentication schemes. Ids are specified using the form scheme:id, where scheme is a the authentication scheme that the id corresponds to. For example, ip:172.16.16.1 is an id for a host with the address 172.16.16.1. When a client connects to ZooKeeper and authenticates itself, ZooKeeper associates all the ids that correspond to a client with the clients connection. These ids are checked against the ACLs of znodes when a clients tries to access a node. ACLs are made up of pairs of (scheme:expression, perms). The format of the expression is specific to the scheme. For example, the pair (ip:19.22.0.0/16, READ) gives the READ permission to any clients with an IP address that starts with 19.22. READ: you can get data from a node and list its children. You want A to be able to do a set on a ZooKeeper node, but not be able to CREATE or DELETE children. world has a single id, anyone, that represents anyone. auth doesn't use any id, represents any authenticated user. digest uses a username:password string to generate MD5 hash which is then used as an ACL ID identity. Authentication is done by sending the username:password in clear text. When used in the ACL the expression will be the username:base64 encoded SHA1 password digest. ip uses the client host IP as an ACL ID identity. The ACL expression is of the form addr/bits where the most significant bits of addr are matched against the most significant bits of the client host IP. ZOO_AUTH_IDS empty identity string should be interpreted as “the identity of the creator”. The ZOO_OPEN_ACL_UNSAFE is completely open free for all ACL: any application can execute any operation on the node and can create, list and delete its children. The ZOO_READ_ACL_UNSAFE is read-only access for any application. CREATE_ALL_ACL grants all permissions to the creator of the node. The creator must have been authenticated by the server (for example, using “digest” scheme) before it can create nodes with this ACL. The application uses the zoo_add_auth function to authenticate itself to the server. The function can be called multiple times if the application wants to authenticate using different schemes and/or identities. zoo_create(...) operation creates a new node. The acl parameter is a list of ACLs associated with the node. The parent node must have the CREATE permission bit set. This operation returns a node’s ACL info. This function replaces node’s ACL list with a new one. The node must have the ADMIN permission set. Here is a sample code that makes use of the above APIs to authenticate itself using the “foo” scheme and create an ephemeral node “/xyz” with create-only permissions. ZooKeeper runs in a variety of different environments with various different authentication schemes, so it has a completely pluggable authentication framework. Even the builtin authentication schemes use the pluggable authentication framework. The first method getScheme returns the string that identifies the plugin. Because we support multiple methods of authentication, an authentication credential or an idspec will always be prefixed with scheme:. The ZooKeeper server uses the scheme returned by the authentication plugin to determine which ids the scheme applies to. handleAuthentication is called when a client sends authentication information to be associated with a connection. The client specifies the scheme to which the information corresponds. The ZooKeeper server passes the information to the authentication plugin whose getScheme matches the scheme passed by the client. The implementor of handleAuthentication will usually return an error if it determines that the information is bad, or it will associate information with the connection using cnxn.getAuthInfo().add(new Id(getScheme(), data)). The authentication plugin is involved in both setting and using ACLs. When an ACL is set for a znode, the ZooKeeper server will pass the id part of the entry to the isValid(String id) method. It is up to the plugin to verify that the id has a correct form. For example, ip:172.16.0.0/16 is a valid id, but ip:host.com is not. If the new ACL includes an "auth" entry, isAuthenticated is used to see if the authentication information for this scheme that is assocatied with the connection should be added to the ACL. Some schemes should not be included in auth. For example, the IP address of the client is not considered as an id that should be added to the ACL if auth is specified. ZooKeeper invokes matches(String id, String aclExpr) when checking an ACL. It needs to match authentication information of the client against the relevant ACL entries. To find the entries which apply to the client, the ZooKeeper server will find the scheme of each entry and if there is authentication information from that client for that scheme, matches(String id, String aclExpr) will be called with id set to the authentication information that was previously added to the connection by handleAuthentication and aclExpr set to the id of the ACL entry. The authentication plugin uses its own logic and matching scheme to determine if id is included in aclExpr. Care should be taking to ensure that the suffix on the property is unique. If there are duplicates such as -Dzookeeeper.authProvider.X=com.f.MyAuth -Dzookeeper.authProvider.X=com.f.MyAuth2, only one will be used. Also all servers must have the same plugins defined, otherwise clients using the authentication schemes provided by the plugins will have problems connecting to some servers. Updates from a client will be applied in the order that they were sent. Updates either succeed or fail -- there are no partial results. A client will see the same view of the service regardless of the server that it connects to. Any updates that are seen by the client, through a read request or successful update, will never be rolled back when recovering from server failures. The clients view of the system is guaranteed to be up-to-date within a certain time bound (on the order of tens of seconds). Either system changes will be seen by a client within this bound, or the client will detect a service outage. Using these consistency guarantees it is easy to build higher level functions such as leader election, barriers, queues, and read/write revocable locks solely at the ZooKeeper client (no additions needed to ZooKeeper). See Recipes and Solutions for more details. ZooKeeper does not guarantee that at every instance in time, two different clients will have identical views of ZooKeeper data. Due to factors like network delays, one client may perform an update before another client gets notified of the change. Consider the scenario of two clients, A and B. If client A sets the value of a znode /a from 0 to 1, then tells client B to read /a, client B may read the old value of 0, depending on which server it is connected to. If it is important that Client A and Client B read the same value, Client B should should call the sync() method from the ZooKeeper API method before it performs its read. So, ZooKeeper by itself doesn't guarantee that changes occur synchronously across all servers, but ZooKeeper primitives can be used to construct higher level functions that provide useful client synchronization. (For more information, see the ZooKeeper Recipes. [tbd:..]). The ZooKeeper client libraries come in two languages: Java and C. The following sections describe these. There are two packages that make up the ZooKeeper Java binding: org.apache.zookeeper and org.apache.zookeeper.data. The rest of the packages that make up ZooKeeper are used internally or are part of the server implementation. The org.apache.zookeeper.data package is made up of generated classes that are used simply as containers. The main class used by a ZooKeeper Java client is the ZooKeeper class. Its two constructors differ only by an optional session id and password. ZooKeeper supports session recovery accross instances of a process. A Java program may save its session id and password to stable storage, restart, and recover the session that was used by the earlier instance of the program. All completions for asynchronous calls and watcher callbacks will be made in order, one at a time. The caller can do any processing they wish, but no other callbacks will be processed during that time. Callbacks do not block the processing of the IO thread or the processing of the synchronous calls. Note that if there is a change to /a between the asynchronous read and the synchronous read, the client library will receive the watch event saying /a changed before the response for the synchronous read, but because the completion callback is blocking the event queue, the synchronous read will return with the new value of /a before the watch event is processed. Finally, the rules associated with shutdown are straightforward: once a ZooKeeper object is closed or receives a fatal event (SESSION_EXPIRED and AUTH_FAILED), the ZooKeeper object becomes invalid. On a close, the two threads shut down and any further access on zookeeper handle is undefined behavior and should be avoided. The C binding has a single-threaded and multi-threaded library. The multi-threaded library is easiest to use and is most similar to the Java API. This library will create an IO thread and an event dispatch thread for handling connection maintenance and callbacks. The single-threaded library allows ZooKeeper to be used in event driven applications by exposing the event loop used in the multi-threaded library. The package includes two shared libraries: zookeeper_st and zookeeper_mt. The former only provides the asynchronous APIs and callbacks for integrating into the application's event loop. The only reason this library exists is to support the platforms were a pthread library is not available or is unstable (i.e. FreeBSD 4.x). In all other cases, application developers should link with zookeeper_mt, as it includes support for both Sync and Async API. If you're building the client from a check-out from the Apache repository, follow the steps outlined below. If you're building from a project source package downloaded from apache, skip to step 3. Run ant compile_jute from the ZooKeeper top level directory (.../trunk). This will create a directory named "generated" under .../trunk/src/c. Change directory to the.../trunk/src/c and run autoreconf -if to bootstrap autoconf, automake and libtool. Make sure you have autoconf version 2.59 or greater installed. Skip to step 4. If you are building from a project source package, unzip/untar the source tarball and cd to the zookeeper-x.x.x/src/c directory. See INSTALL for general information about running configure. Run make or make install to build the libraries and install them. If you are building a multithreaded client, compile with -DTHREADED compiler flag to enable the multi-threaded version of the library, and then link against against the zookeeper_mt library. If you are building a single-threaded client, do not compile with -DTHREADED, and be sure to link against the zookeeper_st library. Both the Java and C client bindings may report errors. The Java client binding does so by throwing KeeperException, calling code() on the exception will return the specific error code. The C client binding returns an error code as defined in the enum ZOO_ERRORS. API callbacks indicate result code for both language bindings. See the API documentation (javadoc for Java, doxygen for C) for full details on the possible errors and their meaning. If you are using watches, you must look for the connected watch event. When a ZooKeeper client disconnects from a server, you will not receive notification of changes until reconnected. If you are watching for a znode to come into existence, you will miss the event if the znode is created and deleted while you are disconnected. You must test ZooKeeper server failures. The ZooKeeper service can survive failures as long as a majority of servers are active. The question to ask is: can your application handle it? In the real world a client's connection to ZooKeeper can break. (ZooKeeper server failures and network partitions are common reasons for connection loss.) The ZooKeeper client library takes care of recovering your connection and letting you know what happened, but you must make sure that you recover your state and any outstanding requests that failed. Find out if you got it right in the test lab, not in production - test with a ZooKeeper service made up of a several of servers and subject them to reboots. The list of ZooKeeper servers used by the client must match the list of ZooKeeper servers that each ZooKeeper server has. Things can work, although not optimally, if the client list is a subset of the real list of ZooKeeper servers, but not if the client lists ZooKeeper servers not in the ZooKeeper cluster. Be careful where you put that transaction log. The most performance-critical part of ZooKeeper is the transaction log. ZooKeeper must sync transactions to media before it returns a response. A dedicated transaction log device is key to consistent good performance. Putting the log on a busy device will adversely effect performance. If you only have one storage device, put trace files on NFS and increase the snapshotCount; it doesn't eliminate the problem, but it can mitigate it. Set your Java max heap size correctly. It is very important to avoid swapping. Going to disk unnecessarily will almost certainly degrade your performance unacceptably. Remember, in ZooKeeper, everything is ordered, so if one request hits the disk, all other queued requests hit the disk. To avoid swapping, try to set the heapsize to the amount of physical memory you have, minus the amount needed by the OS and cache. The best way to determine an optimal heap size for your configurations is to run load tests. If for some reason you can't, be conservative in your estimates and choose a number well below the limit that would cause your machine to swap. For example, on a 4G machine, a 3G heap is a conservative estimate to start with. Outside the formal documentation, there're several other sources of information for ZooKeeper developers. The excellent Java tutorial by Flavio Junqueira, implementing simple barriers and producer-consumer queues using ZooKeeper. Pseudo-level discussion of the implementation of various synchronization solutions with ZooKeeper: Event Handles, Queues, Locks, and Two-phase Commits.